Today, more than 1 million students are trapped in an education system that wasn’t built for them. That system wasn’t designed to accommodate their disabilities—the kinds of intellectual, cognitive, communicative, and physical conditions that often conjure images of people reliant on wheelchairs and aides, of individuals consigned to dreary, isolated lives. Many of the public schools they attend rest on the assumption that those stereotypes are inevitable truths. But these students, even those with the most severe disabilities, have potential far beyond what they are often educated for. Although the law known as the Individuals With Disabilities Education Act, or IDEA, has long required schools to help students design “transition plans” and provide job training for their lives after graduation, a majority of adults with intellectual or developmental disabilities are unemployed or underemployed. According to a 2012 Bureau of Labor Statistics survey of disabled adults, that’s largely because of a lack of training and education, which respondents listed as the most common barrier to employment aside from the disabilities themselves. “The big concern that remains [is] what happens when you’re done … and you’re finished with school? Are you sitting at home on the couch?” said Margaret (“Muncie”) Kardos, a Connecticut-based educational consultant who helps students with disabilities plan for the transition. The poor preparation, she said, leaves many special-needs people with few other options. Their prospects at graduating are grim to begin with: Nationally, only about two-thirds of students ages 14 through 21 with disabilities graduate with a regular diploma, while most of the remaining students simply drop out. And these figures encompass all students with disabilities, including those who are relatively high-functioning. The statistics for those who are severely disabled are much more bleak. Compared to their peers from all disability groups, youth with intellectual disabilities, for example, have the lowest rates of education, work, or work preparation after high school. A 2011 Department of Education study that looked at the outcomes of young adults with disabilities up to six years after high school found fewer than half of the young adults with multiple disabilities had a paid job at the time of the survey, compared to 79 percent of young adults with specific learning disabilities such as dyslexia. If and when special-needs adults are employed, it’s often in jobs when they’re working exclusively alongside other people with disabilities. In 2014, a Justice Department investigation found that thousands of disabled adults in Rhode Island were fed into “sheltered workshops”—doing jobs like placing tops on bottles and stickers on boxes—for just $2.21 an hour on average. Some of the disabled employees, the report found, were even working for free: A commercial greenhouse, for example, didn’t pay people for picking dead leaves off of plants because the work was deemed “therapeutic.” According to the Washington Post, 30 percent of intellectually disabled adults who were employed in 2014 were working in sheltered workshops where they were segregated from non-disabled adults. Specialized workforce academies for students with disabilities are growing in popularity as a solution to these realities, in part thanks to federal grants and legislation such as the Workforce Innovation and Opportunity Act. Special-education advocates often describe these job-training programs—which often place participants in internships with prospective employers—as the long-awaited solution to the perennial challenge of how to support students with disabilities through graduation and into adulthood. But how different are the experiences at segregated workforce academies from those at sheltered workshops, and how effective are they at leading students to mainstream jobs? 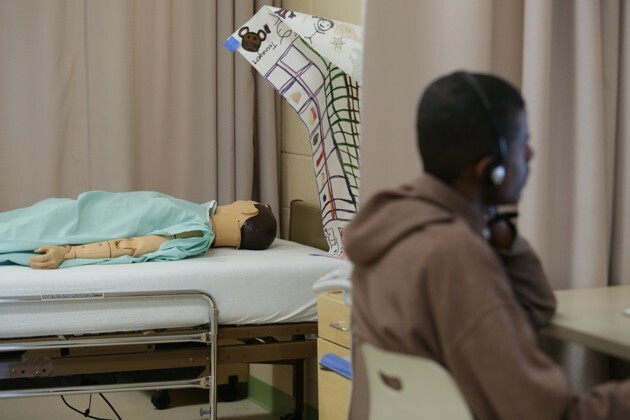 Many school districts now seem to be pivoting away from full-blown inclusion toward more-specialized options like the workforce academies that are, oddly, in some ways reminiscent of the institutionalization era. Not surprisingly, the same concerns are re-emerging, with some critics worrying that such programs are an extreme form of tracking in which students perceived to have limited potential are pigeonholed into non-academic settings and low-paying jobs that nobody else wants. Compounding the issue is the reality that students of color are disproportionately assigned to special education. Do the programs perpetuate inequality and stifle socioeconomic mobility? Do they prevent students from pursuing college? What if the ones who benefit most aren’t the students but the companies that often get to rely on their labor for free? Then there’s the question of whether these programs are truly effective in improving students’ prospects at getting jobs they want. While the country’s schools are still struggling to shepherd students with disabilities into fulfilling lives, experts tend to agree that they’re getting there—and that, with a little trial and error, the newly emerging workforce-preparation programs may be a model that sticks. Kelly Custer stands at the front of a classroom at the River Terrace Special Education Center, gesturing as he walks his students through the math of a problem-solving exercise about money. After pacing in front of a gleaming interactive whiteboard, he pivots toward a group of students sitting in front of a sequence of iMacs and school supplies and asks them to help him solve the question. A few raise their hands gingerly; some look around, smiling; some stare off in another direction completely. He gets a similar response from another group of students, who are sitting against a wall covered in words such as “photosynthesis,” “stomata,” “chlorophyll,” and “carbon dioxide.” Custer guides them through the math and then moves on with the lesson. This is about as academic as things get in this modern Washington, D.C., classroom—at least in the traditional sense of the word. It’s not even a classroom, really. Forget the neatly aligned rows of desks and multiple-choice worksheets and textbooks; forget posters motivating kids to apply to college. The room feels more like a spacious laboratory that blends in with the patio and trees right outside. The north-facing wall is made almost entirely of glass, allowing sunlight to illuminate the room on this chilly day. Potted anthuriums are sitting on each of the several tables where the class’s dozen or so students are clustered. And it smells faintly of dirt—probably because the room is attached to a greenhouse filled with plants and soil and spray bottles and shovels. 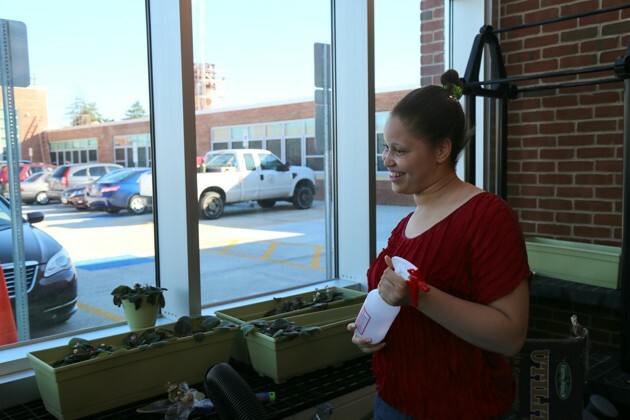 Custer’s course aims to equip special-needs high-schoolers with the basic training they need to get jobs in horticulture. The year-long certificate program is comprehensive and part of River Terrace’s larger Workforce Development Center, which opened this past school year in an effort to feed participants into a handful of industries. Aside from Custer’s track, another suite exposes students to the health-care field—mainly jobs maintaining hospital facilities—and the third trains kids in hospitality. When they’re in the classroom, students learn soft skills—What does it mean to have a job? How do you keep a job? How do you deposit a paycheck?—and practice their work tasks in retrofitted classrooms. (Students in the hospitality track, for example, learn how to prepare a basic meal, make a bed, clean a bathroom, and load a laundry cart in a room that’s equipped with a bed, a hotel-like bathroom, a washing machine, a dining table, and more.) But students spend most of their days doing internships in their respective industries, all of which are paid. For the roughly 35 students who participated in one of the three tracks this past school year, these opportunities may be their only shot at employment later on: They all fall into the 1 percent of students in D.C. Public Schools with the greatest special-education needs. The experiences of other special-education students in D.C. and around the country suggest they would otherwise struggle to enter the workforce, let alone land even minimum-wage jobs. And River Terrace’s students largely live east of the Anacostia River, which has the highest concentration of neighborhoods considered economically challenged in Washington. These are majority-African American neighborhoods with extremely high rates of unemployment, adults without high-school diplomas, and households headed by a single mother. At River Terrace, which is also located in this community, 88 percent of the population is black, 10 percent is Latino, and every single student qualifies for free or reduced-price lunch. The students in River Terrace’s workforce-development center are a relatively small subset of the adult special-needs population in D.C. Public Schools who need a more intensive environment, according to Pamela Downing-Hosten, who oversees transition programs for the district. The district’s previous workforce-development program, she explained, wasn’t adequately preparing students for jobs. So she and other educators consulted students, assessed what kinds of fields would lead to “viable-income, high-demand jobs,” and decided on the three suites. 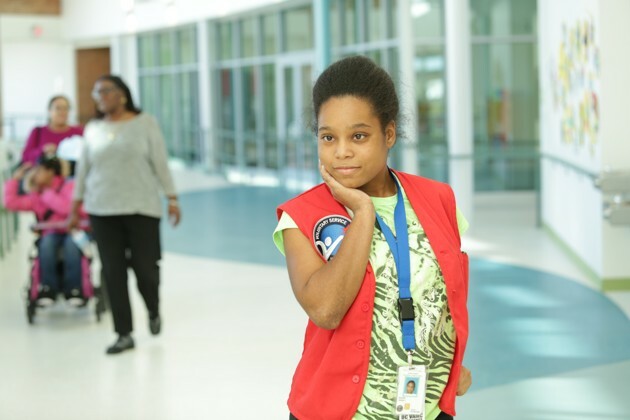 River Terrace’s workforce center exemplifies one of the most promising models in the effort to better prepare the nation’s special-needs students for life after high school—and, in many ways, it actually promotes integration rather than segregation. “We want to expand the concept of inclusion from the classroom to the workplace … On the worksite, [students] are just like any other employee,” Downing-Hosten said. “So they’re not separate and segregated, and that’s the experience we want our kids to have.” While the River Terrace Special Education Campus as a whole serves students in grades two through 12, the workforce component targets young adults ages 18 through 21 who have already progressed through regular high schools. In other words, they’ve already experienced mainstream education; for many, it’s the first time that they’re learning exclusively alongside peers who also have disabilities. “We want them to know that, ‘Okay, here are my abilities, here are my limitations—and I’m going to work competitively despite those limitations,’” Downing-Hosten continued. What’s more, unlike many other job-training programs, River Terrace enjoys the ingredients that Erik Carter, a special-education professor and researcher at Vanderbilt University, has found are key to their later success: things like early employment opportunities, involved families, and supportive community employers. “I’m most excited about programs that provide real-life, hands-on work experiences for students at some point throughout their high school that’s not simulated, that’s not ‘pre-vocational,’ that’s not [simply] preparatory but that puts them in a real place where they’re doing real work that matches their interests,” he said. Research conducted by Carter and two other special-education experts suggests that students are more than twice as likely to have paid employment in their first two years after high school if they have early work experience. Yet fewer than one in four students with intellectual disabilities and autism have early work experiences, according to Carter, and while an increasing number of parents hold high expectations, many are under the impression that sheltered jobs are the only option for those with disabilities. Back in Custer’s classroom, I step into the greenroom to take a look. Andreana Washington, a smiling African American 19-year-old with freckles, accompanies me to demonstrate some of what she’s learned in class. Shyly, she sprays a handful of African Violets and points to the other plants she’s helping to maintain; she chose the horticulture track because she likes working with her hands and being outside. 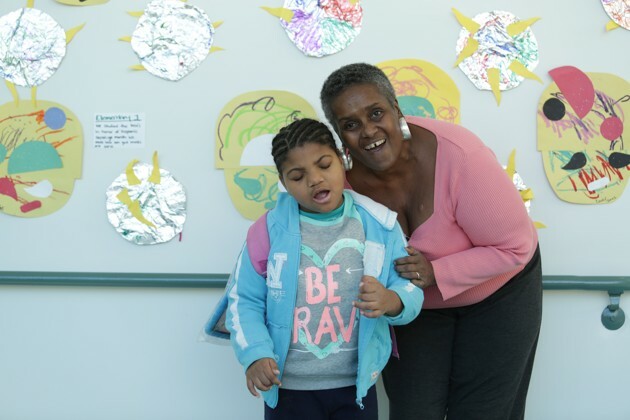 Washington, who has one of the best attendance rates at River Terrace, doesn’t say much when I ask her questions, nor does she look directly at me, but it’s clear—from her smile, her gestures, her occasional giggle—that she enjoys working with plants and her teacher. When we go back into the classroom, she takes her seat and listens attentively, keeping her eyes on her teacher the whole time. That sense of belonging is evident in many of the students I chat with over the course of my visit. 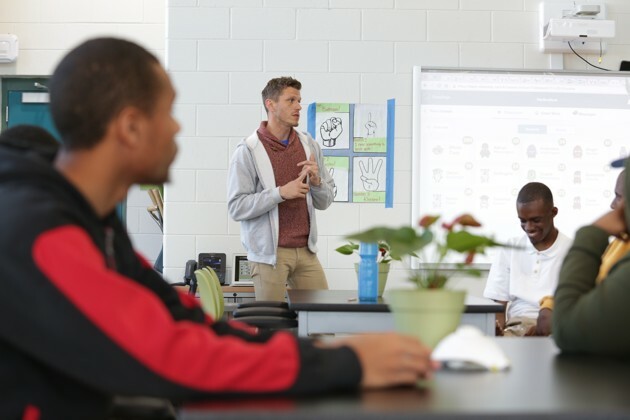 Each classroom has a different tenor, but all are lively, with students engaging in different activities or raising their hands in response to a teacher’s prompt. One of the most engaged students on campus is Janika Napper, a student in the health-care suite. Napper, who eagerly poses for the camera as she grins a toothy smile and displays her VA Medical Center volunteer vest, spends her shifts at the hospital washing tables, stacking trays, and restocking paper towels in the food court, among other tasks. Her back against a sign detailing how to use syringes, the 20-year-old explains that she enjoys the job—and plans on putting all her earnings into a saving account—but doesn’t want to do it forever: She wants to be a fashion designer. As she goes off to talk to some friends, a teacher motions me over to explain that she’s also the class president and a member of the prom committee. In fact, according to the teacher, she even planned a donation drive for old dresses for last year’s prom. 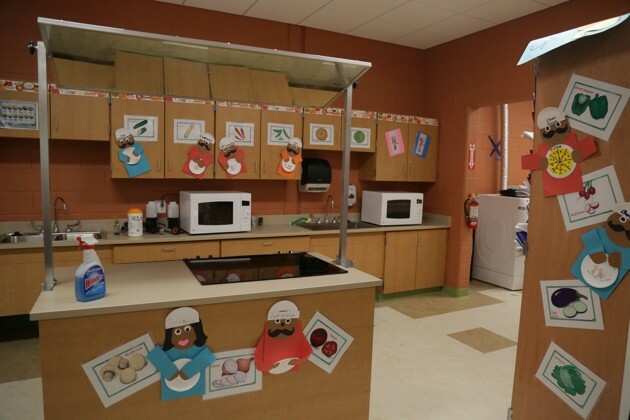 Down the hall, Adrian Bland tells me about her experience in the hospitality suite, which partners with Embassy Suites to train kids in a range of positions, from housekeeping to food prep. Bland works as a porter, what she later described as her dream job. “I like that I get to talk to people,” responded Bland, 18, when I asked her the best thing about the job, which she elected after trying out a number of positions, including as the door person, laundry attendant, and dishwasher. The fact that she, unlike at the other hotel jobs, gets tips also helps; her biggest single tip amounted to $20, she adds, beaming. As of early June, Bland is one of the few River Terrace students to have secured a job: She’s been hired by Embassy Suites’s Chevy Chase Hotel. During my visit to River Terrace, Napper and Bland—both of whom are graduating this year—are visibly proud. And they clearly feel at home. When students start to trickle out into the hallways at the end of the school day, chatter reverberates throughout the glass hallways, and the campus looks just like any other high school. Although inclusion looks great on paper, such programs seldom succeed in lifting disabled students’ opportunities, and that’s probably why teachers such as Custer and Jamin Hollingsworth, the hospitality teacher, champion places like River Terrace. For many educators, the employment outcomes generated by these specialized programs are more important than the fact that students are segregated from the mainstream population. But that doesn’t give school districts license to prioritize workforce programs that separate special-needs students from their peers over others that promote inclusion, argued Vanderbilt’s Carter, who worked as a transition specialist before getting his doctorate. The conversation, he said, should instead be on how to improve inclusive programs so that special-needs students get the support they need. Integrated workforce programs can also help motivate special-needs youth, Carter said, giving them the opportunity to hear about their peers’ college and career goals. Then there’s the more abstract benefit of showing mainstream children and teachers that special-needs students—even those with more severe developmental disabilities such as Down syndrome—have workforce potential. What’s at risk of being lost when special-needs students enroll in specialized programs such as River Terrace are “the opportunities for others in the community to come and see people with severe disabilities as having gifts and strengths and to see them in a different light,” said Carter, who isn’t familiar with the River Terrace program specifically but has researched its general model extensively. Another risk is that the programs pigeonhole severely disabled students into a vocational path and as a result never encourage them to consider college. The DOE’s longitudinal study found that slightly fewer than one in three of the people with multiple disabilities had enrolled in some type of postsecondary schooling. Yet for many of them, higher education is possible; in fact, roughly 250 colleges across the country, including Carter’s Vanderbilt and places like Georgia Institute of Technology and Syracuse University, enroll and provide extra supports for students with intellectual disabilities, often with strong results. According to Carter, more than a third of all high-school students with intellectual disabilities have in their transition plans the goal of attending some sort of postsecondary educational institution. In a survey of more than 1,000 parents of students with such disabilities in Tennessee, three-fourths of respondents identified college as “an important goal.” Just 15 percent actually end up enrolling within two years after high school. Just because it emphasizes practical skills over academic ones, however, encouraging special-needs students to pursue career-and-technical education isn’t necessarily setting them up for failure; some research suggests quite the opposite. To assess whether negative tracking was happening in its well-established network of vocational schools, the state of Massachusetts consulted Shaun Dougherty, an assistant professor of education policy and leadership at the University of Connecticut. Dougherty did find that students with disabilities were overrepresented in the state’s voc-tech schools, accounting for about 25 percent of their enrollment (versus 15 percent of the entire high-school population). Yet attending a voc-tech school often enhanced a special-needs student’s educational prospects. Compared to their peers with disabilities who weren’t in the workforce programs, they were more likely to finish high school in four years—a particularly noteworthy statistic considering special-needs students can stay in school until age 21, according to Dougherty. “On all available objective measures, students [with disabilities] were no worse off and actually better off in terms of high-school graduation,” he said. Still, research on whether such programs actually improve special-needs kids’ long-term economic outcomes is mixed. Although participation in a workforce program tends to boost special-needs students odds at graduating, there isn’t much recent evidence to suggest that it makes a significant difference in terms of their post-graduation employment and wages. In an April study for the right-leaning Fordham Institute, Dougherty looked at schools in Arkansas, where the vast majority of students take at least one career-and-technical course. While taking such courses raised a typically developing student’s employment odds and wages one year after high school, the impact wasn’t as apparent for special-needs students. “For students with disabilities, they’re not worse off—it’s just not clear that they’re experiencing the same benefit as their typically developing peers,” Dougherty said. At River Terrace, the ingredients that Carter and Kardos highlighted as key to a transition program’s success seem to be coming together. The school has a deliberate curriculum. The students are doing real work; they’re paid. Parents seem engaged: The school has a thriving PTA that fundraises and helps organize movie screenings at the school’s outdoor amphitheatre. And the respective employers, along with D.C.’s Rehabilitation Services Agency, have bought into the program. Groundworks Anacostia—a nonprofit that focuses on environmental restoration and partners with students in the horticulture track, training them how to do things like grow seedlings and maintain fish traps—even showcases the partnership on its website and encourages other community organizations to participate in River Terrace’s career fair. Even though the company doesn’t pay the students’ salaries, Embassy Suites treats the students like actual employees, Hollingsworth said. And ultimately, students like Washington and Napper and Bland are at River Terrace because they want to be there. “It comes down to having choice and not having that decision [to enroll in the school] being made based on your disability or your IQ score,” Kardos said. Still, despite all that, the school’s end-of-the-year results demonstrate just how tricky transition planning remains. Less than half of the students who enrolled in the workforce center this past year are graduating, and only five have landed jobs so far. The school year ends in just a few days.